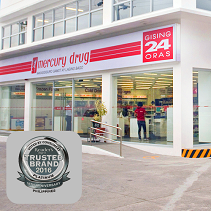 Once again, Mercury Drug was voted a platinum trusted brand in the 2019 Reader’s Digest Trusted Brands survey, Pharmacy/Drugstore Category. To win a platinum trusted brand award, a brand must vastly outpoll other brands in the Trusted Brands survey on attributes of trustworthiness, credibility, quality, value, understanding of customer needs, innovation and social responsibility. The results of the 2019survey conducted by Catalyst Research showed that Mercury Drug led on all attributes, a proof of consumers’ faith and confidence in Mercury Drug. 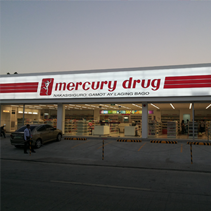 Mercury Drug is now accepting payment of medicines and other products using GCash scan to pay mode of payment. 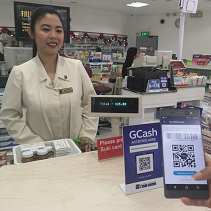 Available in more than 800 Mercury Drug stores nationwide, the scan-to-pay technology offers another convenience to customers, who can also avail of GCredit service to pay for medicines and other healthcare needs especially during emergencies. Mercury Drug is awarded as one of 2018 Asia’s Most Trusted Brands (Most Trusted Pharmacy Chain) in ceremonies held at Hotel Grand Hyatt, Bangkok, Thailand. 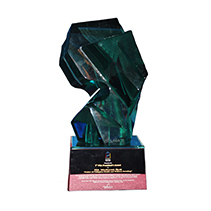 Asia’s Most Trusted Brand Award is given by International Brand Consulting Corporation USA, based on a most comprehensive survey done by Media Research Group (MRG), which asked consumers about the brand they trusted most according to top-of-mind awareness, last brand used and brand intended to use in the near future. Mercury Drug Vice Presidents Bert Amor and Martin Gumayan received the award on behalf of the company. 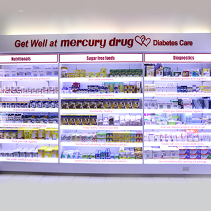 Mercury Drug launched another first in the pharmacy retail industry – Get Well at Mercury Drug Diabetes Care, a diabetes specialty corner for diabetics and their families. The corner features a complete assortment of products such as sugar-free food items, clinical nutrition products, glucometers, strips and lancets, complemented by a counseling service manned by pharmacists specifically trained in diabetes management. Initially available at Mercury Drug’s Makati City Ayala Center Glorietta store, the Get Well at Mercury Drug Diabetes Care is made possible through the support and cooperation of the Philippine Society of Endocrinology, Diabetes and Metabolism, the Philippine Pharmacists Association and Merck Sharpe and Dohme. Mercury Drug came out the winner, for the third year in a row, in the 2018 Reader’s Digest Trusted Brands survey, Pharmacy/Drugstore Category. 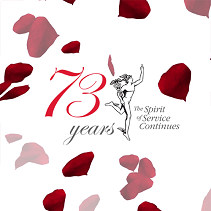 Results of the survey showed that Mercury Drug reaped scores that vastly outpolled other drugstores on attributes of trustworthiness, quality, value, understanding of customer needs, innovation and social responsibility, thus meriting the Platinum Trusted Brand Award. Reader’s Digest says, "the results of the 2018 Reader’s Digest Trusted Brands survey present a captivating and transparent analysis of consumer confidence in the brands driving the Philippines economy. We are confident that the results of the survey provide a truly accurate measurement of consumer sentiment for 2018." Mercury Drug celebrates its 73rd anniversary today by taking part in the Operation Bigay Lunas program of Mercury Drug Foundation. Mercurian volunteers will help ensure that the simultaneous whole-day medical outreach will proceed smoothly in underserved communities in Malabon City, Pasig City, Bacoor City, Alaminos City, Daet in Camarines Norte, Kalibo City and Butuan City, where thousands will be provided with free medicines and various medical services including medical consultations, health screening, preventive education and feeding service. Mercury Drug is now accepting payment of medicines and other consumer goods via PayMaya QR. 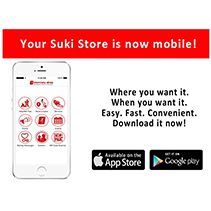 The scan-to-pay technology is another innovation to enhance the experience of its Suki customers that will not only cut down the lines but will also eliminate the need to process loose change. 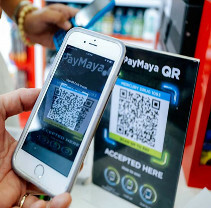 Customers need only to open their PayMaya app, press the 'Scan' button, point their phone’s camera to the QR code displayed in Mercury Drug store counters and enter the amount they need to pay to complete their transactions. 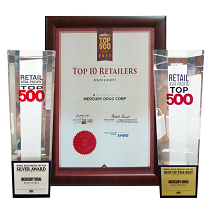 For the third time, Mercury Drug emerged as "Best-of-the-Best" in the Top 500 Awards of Retail Asia, which ranks the top retail companies in the Asia-Pacific region. Held at The Westin Kuala Lumpur, Malaysia, the ceremony also recognized Mercury Drug among the Top 10 Retailers, meriting a Silver Award, a distinction which the company has received since 2004. 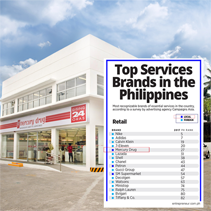 Mercury Drug ranked first in the list of most recognizable local brands of essential services in the Philippines, based on the online survey studying consumer behavior in 11 Asia Pacific countries, conducted by Campaign Asia-Pacific in March 2017. 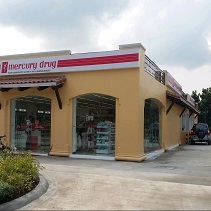 Mercury Drug opens its 1100th store today in Cabuyao City, Laguna at 35 National Highway, Barangay Banaybanay. Open from 7:00 am till 10:00 pm, this new store carries a wide range of medicines – branded or generic – and features a self-service section offering personal care and other healthcare items, as well as basic household items. For the second year in a row, Mercury Drug has been voted Platinum Most Trusted Brand in Reader’ Digest Most Trusted Brand Survey, Pharmacy/Drugstore Category. Released on 7 March 2017, the survey ranks the brands in various categories that are top of mind among customers. Reader's Digest asserts that "maintaining a ranking on the Trusted Brands list involves a genuine commitment to protect and fulfill the promises made to the consumer, ensuring that quality does not decline, and delivering value and satisfaction each and every time." Clinching the Platinum Most Trusted Brand in the Pharmacy/Drugstore Category two years in a row affirms that Mercury Drug has consistently gained the consumers' trust. 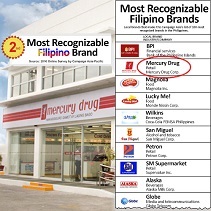 Among the local brands that made it in Campaign Asia’s list of 100 most recognized brands in the Philippines, Mercury Drug emerged as the most recognizable Filipino brand in the retail category. The list is culled from Campaign Asia-Pacific’s 2016 research on consumer brand perception, conducted by Nielsen. The survey asked respondents the best brand that came to their mind translated as the one they trust the most or the one that has the best reputation in the given category. 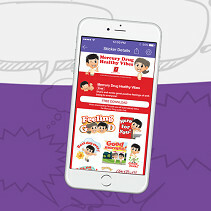 Mercury Drug launches today its animated sticker pack in Viber app. The free "Mercury Drug Healthy Vibes" stickers express great positive feelings of well-being which Viber app users can share with family and friends to evoke good vibes. Several promotions are lined up from December 1, 2016 to March 1, 2017 in Mercury Drug stores and Facebook page, with exciting gifts for early downloaders. 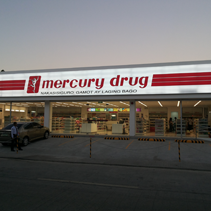 Mercury Drug Las Piñas City Villar SIPAG opens today in Las Piñas City at C-5 Road Extension, Pulanglupa Uno. With a drive-thru facility, this branch offers customers the option to just drive in and get their order as they drive through.. 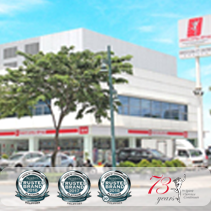 In the 2016 Reader’s Digest Trusted Brand Survey, Mercury Drug was voted Platinum Most Trusted Brand in the Pharmacy/Drugstore Category in the Philippines. 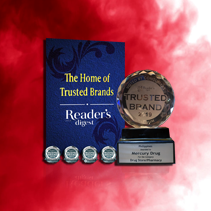 Conducted for the last 18 years, the Reader’s Digest Trusted Brand Survey polls consumers on brands which they depend on, believe in, and which they expect to provide premium value and exceptional service. The Reader’s Digest Platinum Trusted Brand Award is given to brands that performed exceptionally, winning their category with a score that vastly outpolled their nearest competitor. 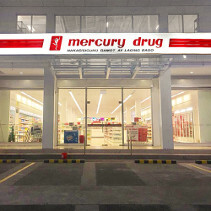 The ‘Smart Shopper 2015’ study, conducted by Kantar Worldpanel, identified Mercury Drug as the retailer of choice for Filipino shoppers due to accessibility, trust, and distance from home: 86% said there is a Mercury Drug store near them; 64% of those who said they will visit Mercury Drug actually visited a branch in the last 12 months. Kantar Worldpanel is a marketing industry tracker. Data from Smart Shopper 2015 is based on a questionnaire Kantar Worldpanel administered across 2,000 urban homes nationwide. For the second consecutive year, Mercury Drug was named “Best-of-the Best” at Retail Asia’s Top 500 Awards Ceremony held at Manila’s Solaire Resort and Casino. 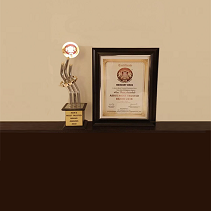 The award is an affirmation of Mercury Drug’s excellent business performance, value proposition, corporate social responsibility and sustainability initiatives, core competencies and business strategy. In the same event, Mercury Drug also retained its Top 3 ranking in the Top 10 Retailers’ category by Economy, a distinction which the company has received since 2004. The Retail Asia-Pacific Top 500 ranking was launched in April 2004 as the industry’s first regional ranking of the top 500 retail companies in the Asia-Pacific region. Researched by Euromonitor International on a yearly basis, the ranking covers 14 key economies and 10 retail formats. The ranking of the 500 companies is published in Retail Asia magazine, a publication of NCYU Media Pte Ltd, the regional leader in the retail information business. 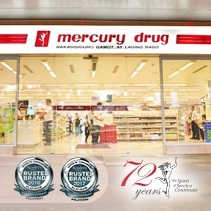 Mercury Drug was the 2015 Country Winner of the Customer Service Excellence Award given by the Federation of Asia-Pacific Retailers Association (FAPRA) at the 17th Asia Pacific Retailers Convention and Exhibition (APRCE) at the Manila Marriott Hotel, in recognition of Mercury Drug’s achievements and major contributions in exemplifying exceptional customer service. 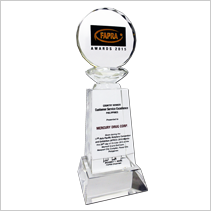 The FAPRA Award is a bi-annual award which honors companies, associations and individuals who have reached outstanding achievements in retail industry in the Asia-Pacific region. 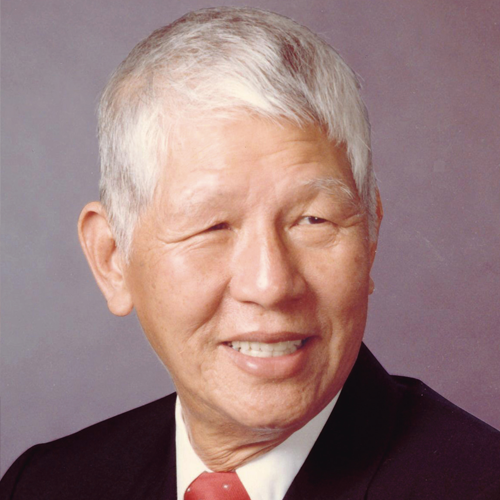 For being the pioneering spirit behind the pharmaceutical retail industry in the Philippines and in recognition of his deep involvement in philanthropy and various advocacies, Mercury Drug founder Mariano Que was conferred an honorary degree, Doctor of Humanities, by the University of Santo Tomas. 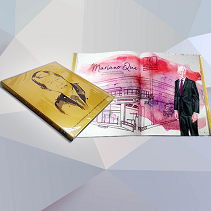 The award cited Mr. Que’s dedication to provide affordable and accessible health care to Filipinos, spanning 70 years. 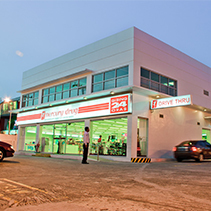 Mercury Drug opens another drive-thru service in Makati City at its 24-hour EDSA Danlig store. Motorists in the busy EDSA highway can now avail of quick service along the way by just driving in for their medicines and other healthcare needs. Android smartphone users can now download Mercury Drug App at Google Play. 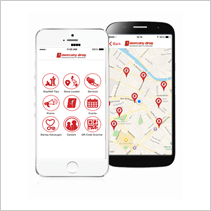 Now, all smartphone users can easily search for the nearest Mercury Drug store, see special product offers, find free clinics and more. 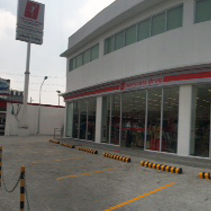 On its 70th anniversary, Mercury Drug opened its landmark 1000th store at Bayani Road, Western Bicutan, Taguig City. Mercury Drug founder, Mariano Que; President Vivian Que-Azcona; executives and officers of Mercury Group of Companies; Mercury Drug business partners and suppliers graced the formal opening of the store. Mercury Drug App is now available for free at AppStore, allowing customers anywhere to easily search for the nearest Mercury Drug store, see special product offers, find free clinics and more. The Android version will soon follow. Retail Asia once again named Mercury Drug Corporation as one of the top performing retail companies in the Asia-Pacific region. 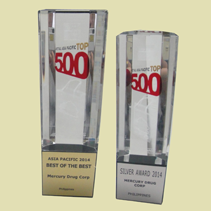 In the 2014 Retail Asia-Pacific Top 500 Awards held in Singapore, Mercury Drug was awarded the “Best-of-the-Best” Retailer’s Award. Its listing at the 114th spot of the Top 500 Asia-Pacific retail companies was the top entry for the Philippines. The Top 500 “Best-of-the-Best” Award is conferred on a select group of retailers who have been nominated from the top-ranking retailers in each of the 14 Asia-Pacific economies and who are judged by an independent jury as the crème-de-la-crème among their peers. 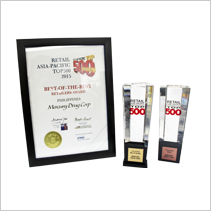 Retail Asia is a prominent Singapore-based publishing company that yearly presents the Top 500 Retailer Awards since 2004. The Top 500 ranking is drawn from Euromonitor International’s research and analysis of the retail industry around the world. Retailers were selected and ranked based on the performance of their brands in each economy. A second drive-thru store opens today in Biñan City Southwoods Ecocentrum, to service customers in the South who prefer express service without leaving the convenience of their cars. 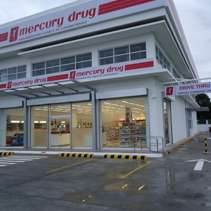 Mercury Drug introduced a first in pharmacy retail with its first drive-thru service in its San Juan City Greenhills Ortigas store. Customers who are in a hurry or who have mobility concerns can now simply drive in, place their order and drive through to pick up their order. © Mercury Drug Corporation. All Rights Reserved.